I can hardly believe that it is already November! October is always one of those months that is filled with football games, birthday parties, and Halloween festivities. With all those activities, the month tends to fly by. This year was no exception. With all of the events and activities there was very little time for me to cook for my family. We have gotten into the rut of either grabbing fast food on the way to or from an activity, or we just plain and simple eat junk! The couple of meals I did make tasted so good. It made me realize how much I have missed eating real home cooked meals. Our fall garden did very well so those home cooked meals included such things as spinach and green beans and will soon include turnips and peas as well. There is nothing as good as fresh veggies from the garden! 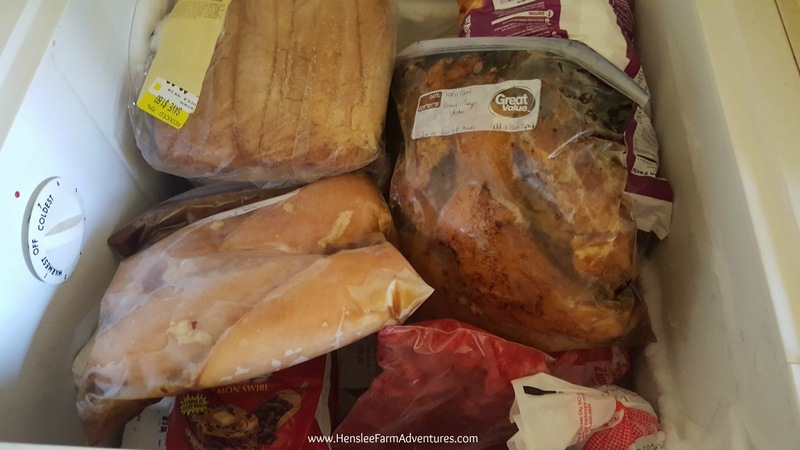 As I was trying to figure out some ideas for meals for this week I was looking through the pantry and freezer and the amount of food we have is astonishing. My first thought was that I really needed to organize my pantry. Then I realized I don't need to organize it, I need to use it! The same goes for our fridge/freezer and our deep freeze. Our deep freeze...this is only the surface. That's when I had a great idea! Why not go a whole month without buying groceries? I was so excited about the prospect of not going grocery shopping. I looked and we have plenty of staples...flour, sugar, eggs (thanks to our ducks), potatoes, onions, etc. We have meat in the freezer from the cow we butchered, and even some pork leftover. We could actually do this! I went to go tell Steve my great idea and then it hit me...Thanksgiving! I completely forgot about Thanksgiving. And we are hosting this year. I don't have a turkey in the freezer. But I do have pumpkin for pie, and I have cranberries for sauce, and I can make bread for stuffing. I started thinking, maybe I can make this work. 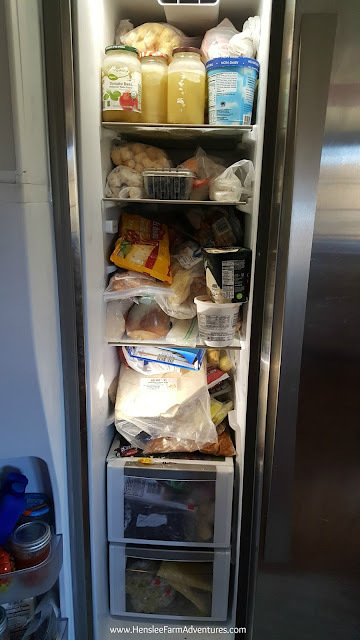 Our fridge freezer, it is pretty packed! After telling Steve my plan he agreed that we could do this and that we needed to. The savings from not buying food could go towards purchasing siding for our house which we desperately need. It would also allow us to use the food we already have, and not let it go to waste where we would eventually throw it away. I hate to waste food! In my thoughts about how this would take place, I started thinking about how we might need to make some exceptions, or what I needed to get, just in case. Those kinds of thoughts are what have gotten us in this food hoard mess in the first place! I am not going grocery shopping. If I run out of bread, I'll bake more. If I run out of milk, I have powdered. We have lots of grains, we have veggies from the garden, and we have meat and eggs. WE CAN DO THIS! So this month, I will be keeping you posted on how this challenge is going every Monday. In fact this post was supposed to be published yesterday, but life happens! I will even let you know some of the meals that we have made, and I will start with what we ate last night. 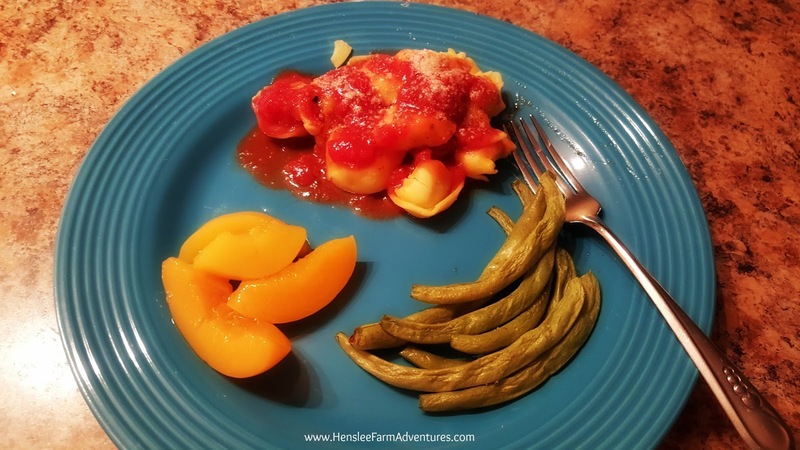 We had Porchini mushroom tortelloni in my homemade canned marinara sauce, roasted green beans from our garden, and canned peaches for dessert. It was Meatless Monday for us. The family loved it and there were just enough leftovers for lunch the next day! Our "blue plate" special meal. I want to stress that this is NOT a no spend month, this is simply a no grocery month. 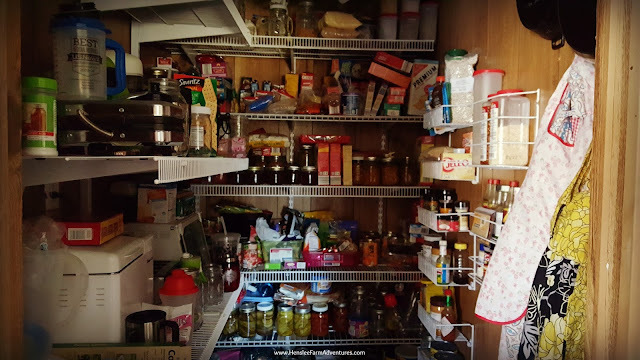 Do you hoard food? 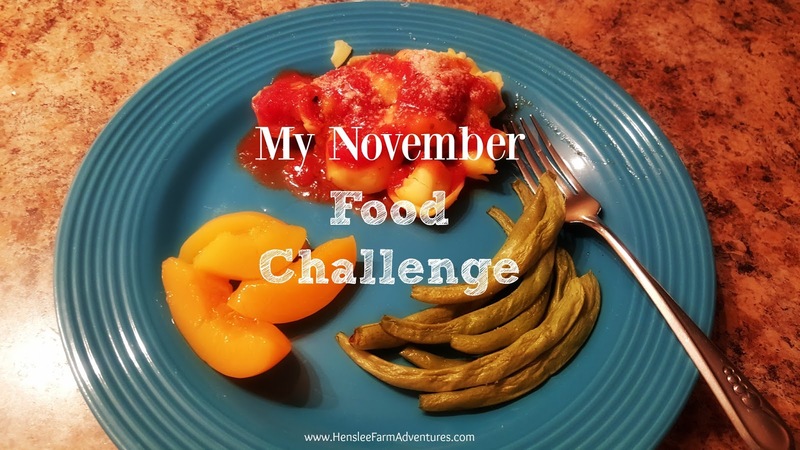 Would you like to try this challenge yourself? If so, let me know in the comments below!